Do you remember the scene in "The Fellowship of the Ring" where Bilbo regales the young hobbits with his life's adventures, facing dragons and turning trolls into stone? The young Halflings' eyes went wide with amazement, and they sat on the edge of their seats, waiting for the next magical words to come out of Bilbo's mouth. 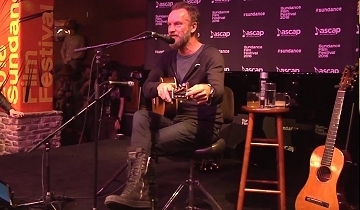 Sting had the same effect on a crowd of Sundance festivalgoers at ASCAP Music Café on Saturday in Park City. Despite starting his set 15-minutes late (to build anticipation, of course), the Police frontman and legendary solo artist walked on stage to huge applause in the small gallery space and immediately launched into an acoustic rendition of "Message in a Bottle." The crowd lost their minds, and Sting, ever the engaging showman, asked them to "help me out, here," initiating a call and response of "Sending out an SOS." It was an evening of storytelling, and Sting had a captive audience. Maybe it was the intimate setting that inspired his honesty or perhaps his bushy beard gave him the confidence of an old raconteur, but Sting candidly and warmly shared personal stories from his life. In his husky voice, he related what it was like growing up in a shipping town, where "you either had to do two things to survive: Learn how to fight or be a very fast runner." Usually, Sting said he preferred a good footrace, but "occasionally, you would have no choice … but to raise a fist." Sting and composer J. Ralph collaborated on a track for "Jim: The James Foley Story," a documentary premiering at Sundance about the photojournalist killed in Syria by ISIS in 2014. The Foley family was in attendance for Sting's performance of the song, "The Empty Chair," with J. Ralph on piano. Sting shared how the film brought him to tears and how he was on the fence about writing the track, until his wife, Trudie, told him, "You have to do this, Sting." The performance was emotional and moving. Sting followed up "The Empty Chair" with fan-favorite "Every Breath You Take," which, instead of coming off as the stalker anthem (as it often does), seemed to further reflect the memory and celebration of Foley's life. He finished his seven-song set with "Fragile," showcasing his guitar skills and closing out the story for the night. Even after thousands of performances, it felt like his tales were meant for this audience, and they were privileged to share in the magic.